Time and again we are asked, "How do we create links from pearls and semi-precious stones." The holes drilled in these are often too small to accomodate wire with sufficient strength to be used as links. Sometimes, crystal is misdrilled and needs help. Of course, the solution is simply to ream the pearl or stone but sitting down and using a hand reamer is so time consuming that few are willing to take the time or risk the damage to the component. Actually, there is a solution that will no longer limit you to stringing and will unleash your creativity. Before we get started, it is extremely important that you understand that the proper tools are required. We are going to be working with water and electricity and you can be injured or killed if you decide to try to save money by using a different tool arrangement. It is extremely important that you purchase the proper type of power tool and reamer bits other wise you will face the possibility of personal injury and/or damage to the pearls or stones. The process of "power reaming" will also expose your fingers to abrasive materials. This means you are going to have a "whoops" or two during the learning process. So let's talk about the power tool itself. There are three basic types. The first type is the least expensive. 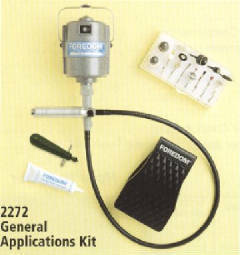 It is a bead reamer whose power supply is a transformer that plugs into a standard wall outlet. The voltage is reduced and then sent to the reamer motor. The reamer motor holds a diamond encrusted reamer bit that can be replaced when worn. The item to be reamed is held under a stream of water to keep everything cool and clean. The problems with these tools include a lack of power and a fixed reamer speed. In addition, these tools cannot be used for grinding, drilling or cutting. The second type is the one we have. 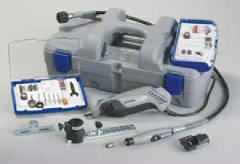 It is a Dremel 400 XPR with the Dremel 225 Flexible Shaft. This type of tool has the power and safety required to ream pearls and stones as well as any drilling, grinding, polishing and cutting you may need to do. Although it is noisy, it works very well. Don't be tempted to eliminate the Flexible Shaft because this will place the electrical motor too close to the water supply that is required for reaming. The third type is the most expensive. It is similar in concept to the Dremel unit but the flexible shaft is not removable so this tend to limit how and where you can use it. The motor assembly needs to be suspended from an overhead arm or mounted on a bench bracket. The flexible shaft is available in different lengths and can hold larger attachments than the Dremel. Whichever type you select, you need to use a quality reamer bit. We use bits sold by Widget Supply Company. We have tried others but were not satisfied with the quality. OK, now let us look at a typical problem involving a pearl with a hole that is too small for use in creating a link. If we examine the picture below, we see that the reamer bit just barely starts into the hole drilled into the pearl. 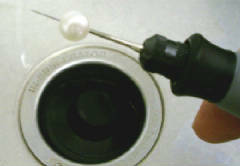 Place the pearl onto the reamer bit as shown. Be sure and plug the drain! By the way, if you are working with old pearls, it is a good idea to soak them for a week in distilled water. Old pearls can be dry and their nacre will be easily damaged if they are not allowed to re-hydrate before working with them. Now we take the hold the pearl gently and place the pearl and bit under running water. You don't want to jam the pearl onto the reamer bit. It is important that the bit is allowed to come up to speed before the reaming can begin. 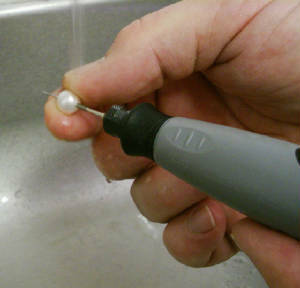 Now gently push the pearl down the bit using a "pecking" motion. This will allow the material that has been removed to be washed away by the water. Failure to do this will cause the bit to quickly wear out. It will also cause the pearl to seize to the bit and start spinning in your fingers. If this happens, turn off the tool, pull the pearl loose from the bit, grab a band-aid, and begin again. Don't be discouraged; it happens to everyone at least once! For large pearls, it may be necessary to ream from both ends.